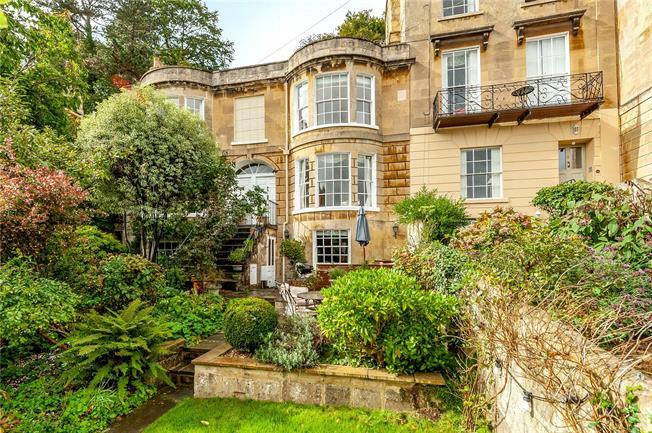 4 Bedroom Terraced House For Sale in Bath for Guide Price £1,000,000. This is a fine example of a Georgian house with its distinctive front facing bay windows. The main hall is at upper ground level leading to a formal drawing room with a fireplace flanked by storage and a bay window with view. Polished floor boards continue through an opening to a withdrawing room again with storage. To the rear is a cloakroom and access to the garden. The lower floor hall opens to a dining room with flagstone floor continuing into a fitted kitchen with wooden tops. On the first floor, a front facing master suite includes a double bedroom with south facing bay window, fireplace surround and flanking fitted cupboards along with a marble tiled ensuite bathroom. The guest bedroom also has cupboards and an ornamental fireplace. On the same level is a family bathroom which also serves the top two bedrooms offering even greater views across the city via roof lights, ornamental fireplaces and eaves storage. Located in one of the most favoured areas of Bath only a short walk of the Larkhall community with it's many local amenities including Primary School, church, supermarket, cafe and many more. With a down hill walk to the Bath city centre past many specialist antiques shops, the views across the Avon valley are to behold. Not only convenient for the wide variety of shops and numerous cultural interests offered in the city centre but well reputed schools are also nearby for all ages. These include St Stephens state Primary and the independent Kingswood and Royal High schools. Just 10 miles south of the M4 at junction 18, Bath Spa railway station provides direct services to the west and London Paddington. Bristol International Airport is only 20 miles distant. Set behind high retaining walls, a flight of winding steps meander through retained and well stocked flower and shrub beds providing a wonderful all year round back drop and lawns. There is also a childs climbing frame and tree house. Immediately to the front of the house is a paved terrace with fitted seating, taking full advantage of the southerly aspect and view. From here a formal set of steps ascend to the main front door. To the rear is a further tiered garden with hard landscaping and gated access to St Stephens Road. The current owners run a successful AirBNB at the house as well as living their themselves. Details on request.